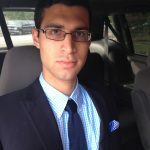 The National Court Reporters Foundation (NCRF) has announced that Jared Orozco, a student from Sheridan Technical College in Hollywood, Fla., was named recipient of the 2017 Frank Sarli Memorial Scholarship. 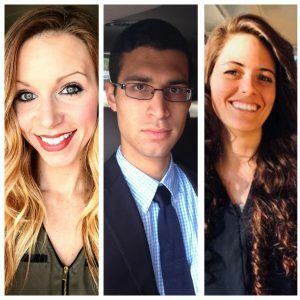 The Foundation also announced that Summer Vaughan, a student from College of Court Reporting in Valparaiso, Ind., and Analisa Arnold from Gadsden State Community College in Gadsden, Ala., are the recipients of the 2017 Student Intern Scholarships. “I chose to be a court reporter because I wanted a job that has a relatively flexible schedule to permit me to do volunteer work and dedicate time to being a minister,” said Orozco. “After I finish school, my ultimate goal would be to work in transcribing sermons to expedite their translation so it can be of benefit to people all over the world.” He plans to use the scholarship funds to purchase a much-needed computer as well as CAT software. 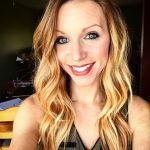 “Court reporting has always been the one job that has stuck out in my mind as my ‘dream job.’ I was always discouraged from going into this career because people are very misinformed about the opportunities available for a court reporter,” said Vaughan, who had pursued a paralegal degree before entering court reporting. 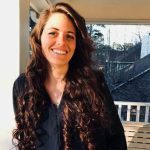 “Once I began my court reporting internship, I knew I was right where I had always wanted to be. The reporters I interned with have been so welcoming, helpful, and encouraging. Nearly all of them have continued to follow my journey and have cheered me on every step of the way.” Vaughan plans to put the scholarship funds towards professional software and certification fees. “Not only is the internship experience a great opportunity for easing fears a student may have about moving from the educational environment to the professional realm, but it also gives an in-depth chance to experience the multifaceted scene of court reporting. The most important lesson I learned from my internship process is court reporting is more than just a job; it’s a rewarding career opportunity that benefits so many people,” said Arnold. She plans to put the scholarship funds toward the start-up costs as she moves forward as a professional. On Sept. 3, The Journal Gazette (Fort Wayne, Ind.) announced the election of NCRA member Tonya Kaiser, RPR, CMRS, to the NCRA Board of Directors. The announcement was generated by a press release issued by NCRA on Kaiser’s behalf. 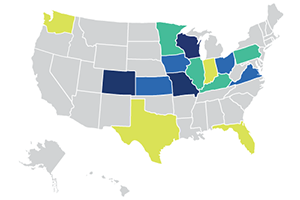 Fifteen states have reported Court Reporting & Captioning Week activities so far. NCRA President Steve Zinone is aiming for activities in all 50 states by the end of the celebratory week. Official proclamations have already been issued in seven states and several municipalities recognizing the 2016 Court Reporting & Captioning Week, which kicks off Feb. 14 and runs through Feb. 20. Court Reporting & Captioning Week highlights the contributions of stenographic court reporters and captioners to society and showcases the growing number of career opportunities in the court reporting and captioning fields. Proclamations by state governors have been issued in Colorado, Florida, Illinois, Kentucky, Ohio, Virginia, and Washington, as well as by local leaders in Johnson County, Kan., Louisville, Ky., and Miami-Date County, Fla. In addition, a growing number of NCRA members and representatives from state affiliates and court reporting schools are sharing information on how they plan to mark the weeklong event sponsored by NCRA. NCRA will donate $20 to the National Court Reporters Foundation for every new member who joins between Feb. 14 and Feb. 20. NCRA President Steve Zinone, RPR, an official court reporter from Pittsfield, N.Y., will join Tonya Kaiser, president of the Indiana Court Reporters Association; Susan Gee, president-elect of the Ohio Court Reporters Association; and Kathy McHugh, president of the Pennsylvania Court Reporters Association, in a panel discussion hosted by the College of Court Reporting, Hobart, Ind., on Feb. 15. The discussion will take place online via the college’s Blackboard Collaborate and will be hosted by Jeff Moody, president of the College of Court Reporting. Panelists will share information about their careers as court reporters, the challenges they faced in court reporting schools, what motivates them to serve as leaders, why association membership is important to students and working professionals, and more. Participation is open to anyone. For more information, contact Natalie Kijurna at kijurna@ccr.edu or 866-294-3974, ext. 229. Members of the Kansas Court Reporters Association will host a legislative reception at the Capitol in Topeka on Feb. 15, where they will provide a realtime demonstration. On Feb. 17, KCLive on television station KSHB will air a piece on the court reporting and captioning profession featuring KCRA President Cindy Isaacsen, RPR, an official reporter from Olathe, Kan. On Feb. 18, KCRA members will host a breakfast for the members of the board of Johnson County supervisors that will include displays of antique machines. Signs celebrating Court Reporting & Captioning Week will also be displayed on the lawn of the courthouse where the breakfast is being held. Wrapping up the week, KCRA members will host a luncheon for court reporting students with whom they’ve been having weekly study groups. Court reporters, broadcast and CART captioners, and court reporting schools around the country will participate in the weeklong event by hosting an array of activities such as visits to high schools to showcase the profession, open houses, Veterans History Project interviews, media outreach, and more. NCRA members, state associations, and schools are urged to share with the Association updates about how they plan to celebrate 2016 Court Reporting & Captioning Week by emailing aroketenetz@ncra.org. Other activities for celebrating the week include sponsoring a court reporting student’s NCRA membership or 2016 Convention & Expo registration fee, mentoring a student, or supporting one of NCRF’s programs by making a contribution. Looking for ways to participate? Visit NCRA’s Court Reporting & Captioning Week awareness page for an array of resources tailored for members, state associations, and court reporting schools. Resources include press release templates, sample proclamations, talking points, posters, presentations, links to the Take Note campaign materials, and more. NCRA has also added a new power point presentation called Careers in Court Reporting to its Court Reporting & Captioning Week resource center. The presentation, which is located under the ideas and additional resources heading on the members, states, and schools section, can be customized by the user. It encourages audience members to learn more about the court reporting and captioning professions by downloading several articles showcasing careers in these fields. 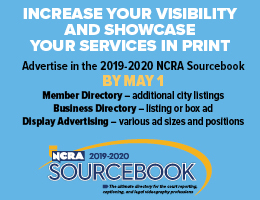 The page that features these articles will also capture contact information from those who access it and provide NCRA with potential leads for new members and students. For a complete list of activities happening to mark the 2016 Court Reporting & Captioning Week, visit NCRA.org/Awareness. For more information, visit NCRA.org. Career information about the court reporting profession — one of the leading career options that do not require a traditional four-year degree — can be found at crTakeNote.com. NCRA member Alice Hadden, an official court reporter for Porter County, Valparaiso, Ind., is featured in an article about her work and the court reporting profession in an article posted Jan. 16 by nwitimes.com. The Indiana Shorthand Reporters Association announced it has officially changed its name to the Indiana Court Reporters Association in an effort to more accurately represent the modern aspects of the profession. The announcement was made in a press release issued on Dec. 2.